Last year we wrote about a timeshare rental vacation to Spain, especially to its Mediterranean islands. In that article we also mentioned that Spain was the third most visited country in the world. Not so any longer. While Spain still offers great vacation destinations such as its elaborate cities that are both historical and cosmopolitan, and sun splashed island beaches, the news now is "China overtakes Spain to become world’s third largest tourism destination." This is according to new figures released by the United Nations World Tourism Organization (UNWTO). In 2010, China enjoyed a 9.4 percent increase in arrivals to 55.7 million, according to the UNWTO. Meanwhile Spain, which is still recovering from the world financial crisis, experienced just a 1 percent increase to 52.2 million. The United States held on to the top spot with 78.95 million arrivals, followed by France, which had 60.88 million, said the UNWTO report. Although Spain lost out on tourism numbers, it attracted a larger volume of high spenders, ranking number two in the world for tourist dollars at $52.5 billion. The US took the top slot and France came third, whilst China ranked fourth receiving $45.8 billion. More Chinese traveled abroad than the foreign visitors the country received. The number of outbound Chinese travelers rose 20 percent over 2009 reaching 57.39 million last year. Chinese tourists ranked fourth-largest worldwide last year. 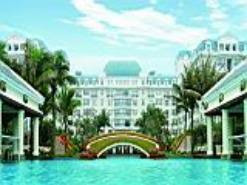 The Crown Spa Resort Hainan (see photo) is located in Haikou City on the northeast coast of Hainan island. The sub-tropical climate is perfect for enjoying this international 5-star hotel-spa-resort, that has both natural hot springs and a private beach. The Chongqing Easpring Hot Spring Resort is in the west central China city of Chongqing, and is another resort centering around relaxing local hot springs. The name Chongquing comes from the Jialing River that runs through the city into the nearby Yangtze River. The Wuzhen Pengda Hotel is located in Wuzhen, Zhejiang, a town in the center of six ancient towns south of Yangtze River. Wuzhen, "in the peace of Peach Blossom land" displays its history through its ancient stone bridges, stone pathways and delicate wood carvings. The canals of Wuzhen have led to it being nicknamed the "Venice of the East."